b) The secure hosted payment option redirects customers at the end of checkout to a secure screen where the credit card details are captured and you are sent back to your website. Both options are fully Visa and MasterCard standards compliant. As eWAY is a specialised payment gateway provider, you will need to sign up with a bank merchant provider (merchant acquirer) as well as eWAY. Once you have your account set up, you will get an account ID and password. Just enter these into the admin of your store and the cart will be able to do the rest. 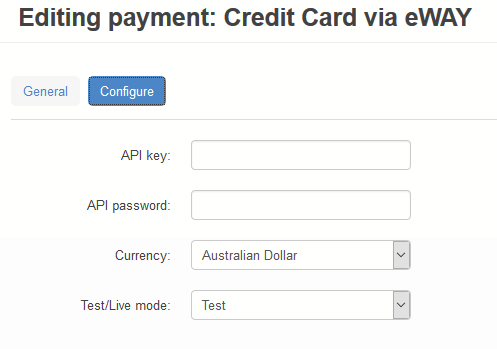 You can set your account into testing mode prior to going live, and test with specific transaction values to see how successful and failed transactions will work in your store. Ozcart has built-in support for the Australia, New Zealand, United Kingdom, Singapore, Malaysia, and Hong Kong eWAY gateways. If you are using the transparent redirect service you will also need to log in to your eWAY account and obtain a special security key that you’ll enter into the admin panel of your Ozcart website. This authenticates your website with your account when the credit card data is securely submitted to eWAY. Please see eWAY’s website for the most up-to-date and detailed information about this gateway. Currency supported: See 1. https://go.eway.io/s/article/Multi-currency and 2.https://go.eway.io/s/article/Can-I-process-multiple-currencies-on-my-site – call eWAY to discuss options for other currencies. Once you have a merchant account set up, you can apply for a gateway account with eWAY. You can request a quote or register with eWAY online.